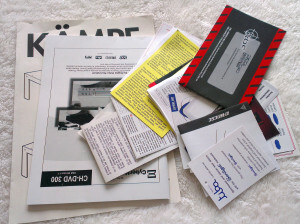 A bunch of old warranties and manuals. While decluttering some paperwork last week my husband came across the removal manifest for our move from America to Australia in 2007. We held on to it to make the comparison with this latest move. There were no fewer than twenty pages of this manifest. That did not even include the items that were in storage here in Australia that were also delivered to our home. All of our electrical items, furniture and any items that would not fit in a packing box, when we left for America, were all left behind. So If I took a conservative guess I would say there were at least 23 pages in all, of boxes, furniture, individual items, suitcases, bikes etc. So, drum roll please, guess how many pages were to the manifest of our recent move. Fifteen? No! Ten? There were not quite five pages. And that my friends is the power of one a day decluttering. So if you have any doubt the one a day can be effective then give up that doubt right now. Granted it took three and a bit years to get to this level but the difference was staggering even to me. Start a trial separation of stationery items. As you light globes wear out replace them with LEDs, they use less power and don’t have the disposal issues of CFLs. Hi Michelle, I wish you every success in convincing your hubby to let go of some documents. When confronted with thousands of sheets of paper one sure can become paralysed by the daunting task and with indecision. Hopefully he will be in a ruthless mood. I think I’m trying to sort of apply this idea to working out (follow my thinking here . . .). Maybe its not one a day decluttering, but its taking the time to try everyday and chip away at it. For example, I like to work out – but then life gets in the way sometimes. In my mind, working out needs to be at the gym for at least an hour. If I can’t do that why bother? Let me tell you – that thinking has gotten me nowhere for quite a few months (insert unhappy face). Then in the last few weeks I have realized I have a treadmill(!!!!!). Why not just run on it 15 minutes a day, in the morning after I drop my kid off at school. Before my shower. Just 15 minutes. If I go over that – great. If not – I chipped away 15 minutes I would not have otherwise taken for myself. Like decluttering – you have to not give up. Needless to say I feel better, and most days I go over. But with the expectancy of just 15 minutes, I can work on it. Anyway good job getting rid of the paper clutter! I can’t say I have done much clearing out lately – just day to day stuff. I have other things on my mind, and since I’m not tripping over anything at the moment – I’m fine with it. Michaela, what a smart way to look at exercise. You go girl. Proud of you. Michaela, excellent idea. It’s always good to take some time for yourself. Hi Michaela, the little at a time approach can be applied to just about anything. And as you say 15 minutes a day exercising is a whole lot better than none. My sister will attest to that and she has worked as a personal trainer. Keep it up. Michaela – it bring to mind this quote I heard recently “You don’t have to get it perfect, you just have to get it going”. That is a great idea! It’s amazing how the day and evening can get away from us. Even if I’d go to the Y to exercise (it’s really cold out now! ), a half hour would be worth making the trip for. I also think in hour blocks. And Michaela, I think you just inspired me, too. Why have I not made that connection before? I desperately need to get more exercise, but I’ve been waiting until I have “enough time” to do it the way I want to. I just don’t have that time right now. But 15 minutes a day is better than zero. Thanks Jo and I am glad you have been inspired by Michaela’s comment. Colleen, this is great. You are a champion of decluttering. I know that we have a lot less than we did but how I wish we had even less. We don’t have a company to move for us just volunteers and I want to make it easy for them whenever we have to move. Hi Deb J, thank you and to think the Steve thought we might not have enough stuff to declutter a thing a day for the first year. I think I did a pretty good job of visualising what it would take to fit into a two bedroom apartment. There is still some decluttering to do but not enough to make the place look untidy. Colleen, I think it is just great how well you have done visualizing and decluttering. With every single item that I remove from the house I feel better. And giving myself permission to go slowly has made it must easier to accept and embrace the improved space. Hi creative me, don’t under estimate the complication of moving just done the street. We did that once (now twice but this one was easy) prior to decluttering and what a nightmare. It was the most awkward move we had ever done. Those were the days when we had to go through a white glove inspection on vacating. Even thought the house we were moving out of was being totally renovated we still had to do a white glove inspection. As usual my husband was out of town while the prep was done and gone again before we were settled in. There was no clothes line erected yet and no phone line available (prior to cell phone being the norm) and two small kids to deal with. I vowed I would never mover around the corner ever again. Most of our other moves involved moving out, taking time to visit family in between and then a couple of weeks later moving into the new location while feeling refreshed from our time off. Colleen – we moved a couple of kilometres down the road and it turned into a massive undertaking. While we certainly weren’t living minimalistic, it was definately before our clutter ballooned. I think, for us anyway, because it was so close we probably didn’t go about it in quite the organised manner we would have had we been loading a truck to move long distance. We decided to just use vehicles and trailers and some family and friends pitched in. We had a removals company but it was still a pain. I am spoiled. I have a small list of things that I like to do every day. They are mainly “me things”, meditate, journal,, gratitude journal, Bible reading, walk, etc. But one of them is Tidy/Declutter. It doesn’t mean a big thing, just a little something every day. But like the pennies saved, it soon adds up. Hi Gillie, that explains why you look so happy in your ID photo. I feel relaxed just thinking about your routine. Good for you. Doing only one thing a day makes it easier and you are a good example of how small things can make a difference over time. Every time I think I am finished decluttering, I find more things. I don’t know if it is because I am more willing to let go or the fact that it is done a little at a time. It doesn’t really matter which method works best for people. They just need to do it. Thanks for all of your encouragement. Thank you Spendwisemom. I have to say I am very pleased with the result. Last time we moved house, not far about 2km, it took 3 hours from start to finish and the moving man said he had never had such an easy move! Three days later every box was unpacked and three weeks later every little job was done (pictures up, new blinds in, etc.) When I see people who have stacks of boxes in their garage from SEVERAL moves ago, I just cringe! Hi Janetta, that was a very smooth move you had. We were unpacked by then end of the day but we had plenty of help. There is still plenty of fine tuning to do but we aren’t in a hurry. There has been a lot of family time lately and that is more important than fixing up a few things around here. I’ll get to them sooner or later. Fearing that I would just be dumping unmovable junk on my local Goodwill, I sent a note out via Facebook last night about the best way to donate costume jewelry. One of my friends responded that she would be interested in it. It’s such a different experience culling out my things when I have a person in mind to give to. I easy found 12 pieces of jewelry for you. Thank for you this challenge. ps – Incredible job with your move manifests! You show the results of small, dedicated actions in such powerful ways. This is so impressive Colleen, I am very inspired by this very tangible evidence of your slow and steady decluttering approach. It is wonderful to be so free of possessions that a move can be contemplated without the extra anxiety of dealing with stuff. My dad often talks about moving since his house is really too big for him and he is afraid the day will come when he can’t deal with the stairs, but I know he is terrified of it because of all the stuff he has accumulated over the years. I know I still have a lot of decluttering to do but as I go through the house I often think about whether I would keep this or that thing if we were moving and this pondering has helped me to detach myself from a lot of possessions. I wish I had come to this realization a long time ago. When we moved to the US from the UK 26 years ago we were given a shipping allowance; we ended up with 20 boxes of stuff which was over the allowance so we shared with a friend who was travelling alone. He had one box, one suitcase and one carry-on. At the time I was flabbergasted but now I am so impressed. He stayed in the US for a few years and then moved back to Europe, and a friend who saw him before he left said that he had sold or donated everything and was just taking a case of clothes and a book with him. On the other hand, I have a neighbor here who has moved 27 times in the last 35 years. When she moved into her current house she apparently had 350 boxes of stuff. A lot of it is fragile, decorative things. What amazes me is that she wants to move again. Christine – 350 boxes – wow! Hi Colleen! I am impressed! You are truly an inspiration to all of us. I want to reach a stage where I can move out of the house in a few hours if I need to and assemble everything in a few hours as well. Congratulations on your move and on your decluttered way of life! Andreia – exactly what I want. I have to admit that even though our house is 1000% better than it used to be, shifting each room into the garage to make way for painting was an eye opening exercise. It still makes a sizeable heap when dumped in the centre of the garage floor! As each person has moved back into a room they have left behind what they don’t want or couldn’t be bothered putting back or couldn’t find under the next lot of stuff that was dragged out there. I have sooooo much stuff to sort through, and I just heard that we are having visitors not this weekend but next weekend, so I need to knuckle down and get it done. Just wanted to thank you so much. I have always been a binge purger but am changing my ways and following the 1 thing a day approach. I have even made my first Gumtree/Facebook listing for sale and have 3 people interested in buying it. YAY! 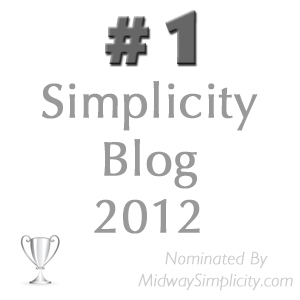 I am not really sure how I found your blog but am now sharing it with everyone I know. I also love that you are a fellow Aussie! Would you believe that we found videos in our old TV cabinet but we haven’t had a video player in years. I also thank you for giving me permission to rid myself of the dust collecting “gifts”. I was given a Murano Glass key ring which was bought from Italy but was completely impractical so it sat on a shelf on display. It got donated to a local charity and I’m sure will find an appreciative home. Thanks for helping me to declutter the physical, and the emotional ties (guilt) that binds us to them. Hi Karen and welcome to 365 Less Things. I am glad yo found your way here. It seems the advice here is exactly what you were looking for. And it sounds like you are doing a good job of following it. Good for you. Isn’t it amazing how one little keyring can be a drag on psychological well being. Now imagine the effect lots of clutter has on a person. Get rid of everything that is dragging you down and enjoy what is left. That sure is what I am doing. In the last 24 hrs I have decluttered some special type copier paper, pens, old floppy discs (discarded). I have the stationery, pens, clothing, kitchenware, etc. ready for a Monday pickup from Purple Heart. I also trashed 2 very old folding chairs stored in our shed last night (hoping someone would salvage them before the trash trucks cane…but that didn’t happen). Anyway, I feel I have accomplished alot in this short amount of time and thank everyone for the encourgement I receive. My house,except for 1 bedroom looks OK, but still no where near where I would like it to be. Maybe by the end of the year; if I can unload baseball cards and sports paraphanalia with my husband’s and son’s blessings along with at least one other item daily. P.S. Maybe not having walk-in closets is a blessing in disguise! Anna – I was just about to include a story of our walk in wardrobe in my reply to Andreia above but changed my mind. We’ve been repainting the interior of our house and last weekend my husband decided to do our walk in wardrobe – not because it is so massive that it needed a whole weekend but more that he wanted a small project and taking down the shelving system takes some time etc. When time came to put our clothes back in it…….we were very reluctant to put back stuff that gets stored on upper shelves, it just didn’t seem to belong to this fresh new wardrobe. I don’t mean that I don’t want stuff on the upper shelves but rather it was a case of I don’t want this particular stuff anymore. That is so terrific, Colleen! I love it! I just think it is great that you are living your dream of a small apartment near the ocean. It sounds just perfect. I don’t remember how many pages of inventory our last move was, but when I have to move again it will be considerably less. Keeping your mind focused on the overall goal, (like you mentioned about your visualization of what amount of decluttering was necessary to fit into that two bedroom apartment), helps you get there one day at a time. Thanks Jen, I too hope your inventory is small the next time you move as well. Mind you, because it was small they only sent one packer for a pre-pack. It reminded me of our first move which had at least twice as much stuff and we only got one packer. This time it was over far quicker though and then we had the uplift, set down and unpack all in the one day. The smoothness of that was due to the reduced amount of stuff, that is for sure. Colleen, what an inspiring post!! I applaud your vision accomplished – and hope to follow suit for our home. Does the proof of obvious reduction in stuff make you want to reduce more or are you feeling simply satisfied? While I have felt fairly upbeat these last 10 months about slow but steady progress in my own home decluttering, I recently began gently prodding my parents about moving some things out of their home. They live about 75 minutes away– I am in their home 1 to 3 times a month. Also, the emotional ties on some of their things are tough for me too (more than my own). So I am feeling a bit overwhelmed. I get good ideas from Deb J about patient decluttering with her mother. I told my parents that we would simply start by picking the “low-hanging fruit” — and NOT get into anything that involves difficult decisions, yet. Does anyone have any tips about what approach to take when I am only there occasionally? Also, I have been missing Cindy–is she all right? Hi Vicki K, I most definitely want to reduce more or should I say need to. We have too much wall art and we also want to reduce what is in the cage in the garage so we can give on of the sets of shelves to our son so he can organise his garage. Every time the kids arrive lately we give them something else. Sometimes I forget to photograph it for the blog though which is a shame but never mind, at least it is out of here. I think, when it comes to your parents, that the low hanging fruit is the way to go. Also give them options as to how to get rid of the things they decide to declutter. Making every step easy is the best encouragement I know of. As for Cindy, she still drops in every now and again. Did I not mention late last year that she would not be contribution post any more. That is why Doodle has kindly stepped in to write me a couple of posts each month. She is most certainly missed as she has been with me from the start. Vicky K, your idea of getting the “low hanging fruit” is the best for right now. As time goes by your parents may see the light and start doing the same. For me it has taken a lot of patience and prayer. I am really impressed, Colleen! By the way, you sound really happy in your latest posts. It’s great that you are obviously feeling well in the new apartment! Thanks Sanna, we are very happy in our new location. Today we went for an early morning walk and saw fish jumping, copious amount seaweed that has washed up on one beach, enjoyed the beauty of the early light playing on the water and then on the way home spotted a pod of dolphin swimming in the harbour. Life is good. I am glad you are enjoying the photos. There will be more. That is awesome! Congratulations. Today I carried out another shelf that was in bad shape and put it in the dumpster. It’s wonderful knowing I don’t need to replace this shelf because it is not needed anymore because we’ve decluttered a lot. It’s not to say I don’t still have a ways to go in this journey, I still do…but I’m in a much better place now than when I started! Hi Melissa, that is great new. One less shelf, Woo Hoo! My son just phoned asking when we are going to give him one of the shelve from our cage in the garage. They are both being used at the moment but we are sure we can reduce enough to keep one for us and give him one. That will be a job for this week. I love that you have the two manifests for comparison. Somehow things like this help me to prove to myself that I’m actually making forward progress. Taking photos of before and after fall under that category, for instance, as does making lists of outgoing items. These actions have helped me when my enthusiasm flags or I really have become immune to the progress I’ve made. So happy you’re liking your new place & there’s nothing like the wonderful example you’ve provided for all of us! Thank you! Hi Sumarie, all those ideas you mentioned are also good incentives to keep at it. I have a few good before and after photos to look back on. I took some photos of my new place last week which I will share this week. There will be after shots later on when everything is finally in order. Oh, wow! It is nice to see a quantitative representation of how much great work you have done, especially something you can hold like pieces of paper. Thanks for being a great model of the power of one-a-day decluttering! That is awesome Colleen. Well done! The last time we moved house was in 1986. I have no idea how much stuff/how many boxes we had, as it was a mining town to city move done in a hurry. I do remember that we shared an entire Pickfords removal truck with another couple, we had 2 kids, they had 3. I am pretty sure if we had to do an instant move today, we would likely need 2 whole trucks, and that is with our kids and their stuff long since gone from our house. We have been adding at a faster rate than subtracting for years. Not any more! My decluttering goal is to have just the right amount of stuff by the time we move again – which is maybe a year or two away. I don’t know yet what “the right amount” is, but I hope I will know when I get there. Hi Stephanie, well done to your from realising where you were at with your stuff and doing something about it. When it comes to figuring our how much is the “right amount” just do what I did. Visualise the space you want it to fit into and reduce it to that.